Would Eugénie like these ? As hot summer days are slowly coming in and weddings being very much in the air (no...not mine! ), I'm in the mood for white or ivory lace, velvet ribbons, flowers and frou frou, all these delightful unnecessary things which make us feel fresh and summery. I made these few items some months ago to put in my Etsy shop which I've completely forgotten. But then, I might keep them for my personal use as I enjoyed very much sewing these little things by hand, just like a trousseau really! I titled this post Would Eugénie like these? because at the time I made them, I felt very much inspired by the exhibition held in Paris, in the Musée Galliera Le temps des crinolines, fashion during the French Second Empire. 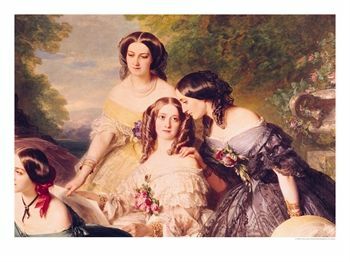 I would have loved to be able to see it as I always had a weakness for Empress Eugénie and the romantic and bucolic portraits her favorite painter Franz Xaver Winterhalter made of her. 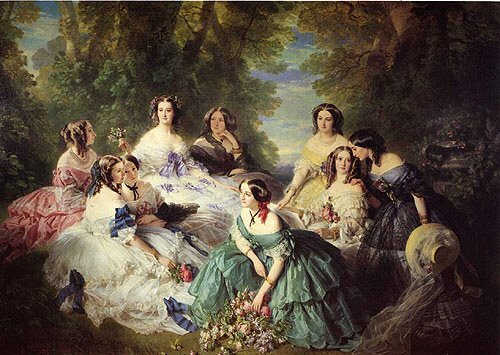 The famous portrait of Empress Eugénie and her ladies in waiting, always impressed me by the richness of attire and fabrics contrasting with the artificial pastoral scene. Slightly off centered towards the left, Empress Eugénie seems to reign over her amiable entourage. Each of them poses gracefully. 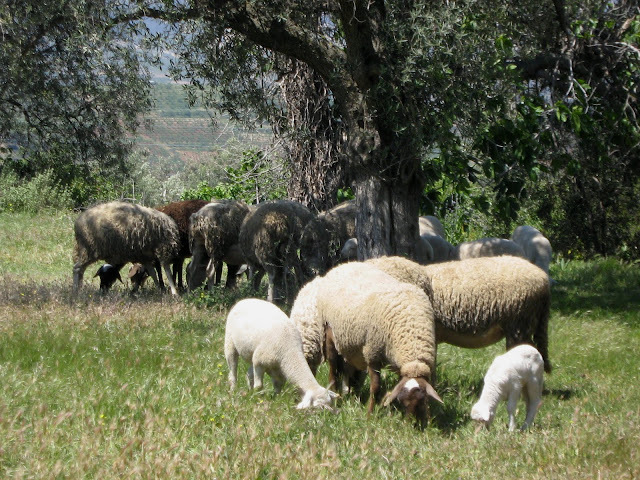 Each of them barely wears jewelry, as if to be more in harmony with the bucolic ambiance. My eye doesn't focus on their face or hair though but mainly on the voluminous crinoline. This happy explosion of silk, mousseline, tulle and ribbons is really what I like in this painting, albeit academic. Why don't we wear flowers in our corsage any more ? It's so much fun ! I wish you all a merry week end! Happy Weekend from New York. Ice cream will be my sin too. Are you going to the feria de Granada this weekend? wow !.. its looks gr8!! Love the different happy colours and the textures. Beautiful. Hope you enjoy your weekend. Stopping by to see what is happening at "The Castle". Such pretty little purses you have created. Also, you are right about the corsages. I'm wearing one tomorrow!! I think Eugenie would drool over them! They are gorgeous! They are beautiful, and I love your inspiration Eugenie! June is the month to think of weddings, bien sur! I'm sure she'd love them, they're all gorgeous! What an absolute and utter delight to have discovered this - the most beautiful and most fascinating blog I've yet had to pleasure to come across. I can't for the life of me understand why I'd not found you before! Well, I have now...and havng spent a most wonderful half hour catching up on your recent posts, I am completely captivated - particularly as Spain is my most favourite country (after my beloved Africa, of course :-)) You have yourself another avid follower< Lala! Cool . . . your blog brought back nice memories of Andulucia, especially Marbella, where I spent all my leave, when I was serving from 1957 to 1960 in Gibraltar. "Costa Del Sol, no te olivida" John. I love your work! It is delightful, whimsical and so feminine. I also truly enjoyed your take on Eugenie and the painting...I loved it. I always find light, inspiration and peace here on your blog. Thank you for your delightful posting!! Fit for an Empress! Loved seeing where your inspiration came from. It would be nice to wear a corsage for no occasion in particular. I'll have to try that! You make me want to dance Alegrias! I see so much of the same in you. I send you a big hug! nice blog. thanks for great picture. I love it. See you on my blog also. I'll wait your coming. My daughter just started sewing and she has really taken to it. I loved this post so much. I loved the pictures. You are an amazing artist.